Chicago Symphony Orchestra – Entertainment Ave! Do You Have Any Desire to See an Opera? Yes. It's always been a dream. Sitting in front of the TV there was an add for Shen Yun at the Chicago Opera House, which I guess is also where the Lyric Opera happens in Chicago, and it occurred to me that one of the weird things on my bucket list is to go to an Opera. I don’t really know why. I guess part of it is that scene in “Pretty Woman” where Richard Gere explains to Julia Roberts that some people enjoy the opera, but for others, it becomes a part of their soul, or something like that. Also, back when I used to work in downtown Chicago, I would walk past the Chicago Opera House and sometimes the backstage doors would be open I would be fascinated by the stage props that I could see. Part of it also probably has to do with my enjoying a good musical, and although different, what the hell. 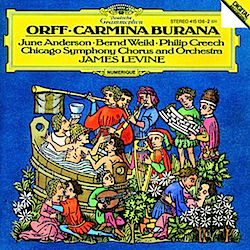 In a not-so-weird juxtaposition I suppose, another thing on my list is to see the Chicago Symphony Orchestra perform Carl Orff’s “Carmina Burana.” My guess is you probably have heard the song “O Fortuna” in a movie yet have no idea what it is (Go ahead, Google it), and back in the day, in the search for the song, I came across a CD of the Chicago Symphony Orchestra conducted by James Levine, and realized I like the entire thing. There are a lot of operas to choose from so in the end my challenge, in thinking about seeing one, is finding one that would be a good introduction to see if I’m one of those that would enjoy it, or if it would become part of my soul. I’m sure I’ll find my way, someday, to the opera, but I wonder: Do you have any desire to see an opera? Posted on March 13, 2014 February 1, 2015 Author Andy LabisCategories Album Reviews, Andy Wonders, General Musings, Home Page, Music Reviews, whatsnewTags Andy Wonders, Carl Orff, Chicago Symphony Orchestra, Lyric Opera2 Comments on Do You Have Any Desire to See an Opera?